Horiatiki Salata or Greek Village Salad, in this warm summery weather what could be nicer? It could easily be argued that a recipe is unnecessary but, you know me, I love to go through the cookery books for inspiration and recipes for anything and everything. Lets face it, I just don’t need an excuse to look at, read or buy cookery books. My name is Georgina and I am unashamedly a cookbook addict. There now, I’ve said it. For Greek food I rarely need to venture further than Vefa’s Kitchen. It is a tome of a book, the Greek equivalent of Italy’s The Silver Spoon, prettily designed to look like the Greek flag, it is a beauty of book. And, it has become my Greek Recipe Bible. This is hardly suprising given that Vefa Alexiadou is, as Google tells me, much like a Greek Delia Smith or Julia Child: a cookery writer and television presenter for 30 years, she is considered the leading authority on Greek cuisine. Vefa’s Kitchen starts out with an introduction to Greek cuisine, which includes some background on its origins and its remarkable influence on all the cuisines that surround the Mediterranean basin; and how Greeks still enjoy many of the dishes their ancestors ate. The book gives about a page of detail on each of the cooking regions of Greece. Vefa touches on everything from Macedonia and Thrace to Epirus and Thessaly, Central Greece, the Peloponnese, all of the Greek Islands including Crete, and even goes beyond the boundaries of Greece into Cyprus. She discusses the bias of these regions and their cooking towards certain ingredients based on what’s available seasonally and in that particular micro-climate. You get a sense of some overlap in the regional tastes but also their particular nuances. Vefa’s Kitchen is thorough in all aspects, all regions are explored and there are recipes for all courses, to suit all budgets and a wide variety of serving sizes. Whilst photography is limited to only a few dishes, the books one and only downfall, what there is is beautifully shot and styled. 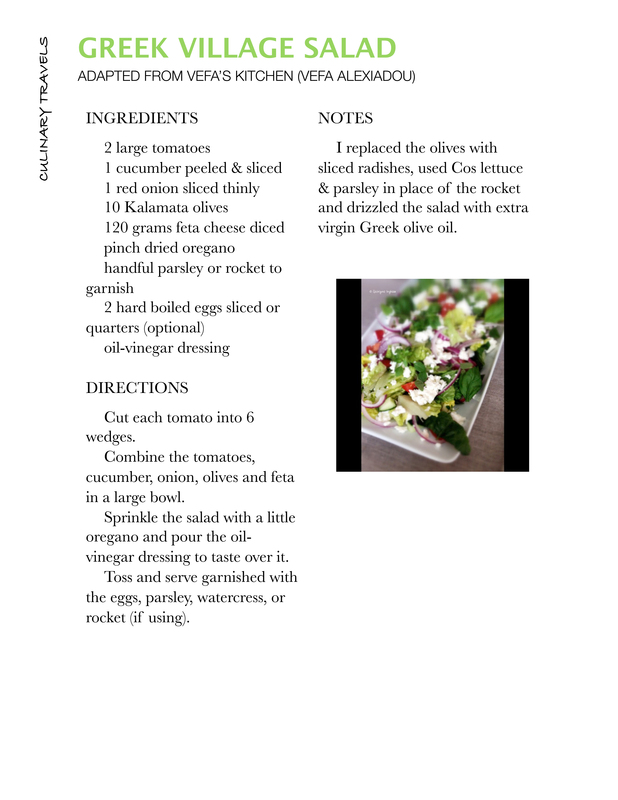 I find Greek salad one of the most refreshing and light meals, perfect for a lazy lunch with friends and family or a light supper sat out in the evening sun. I know a traditional Greek salad should never contain lettuce, but, I had a small cos lettuce sitting my salad drawer of the fridge that needed eating, so in it went and a few radishes fell in too, to replace the olives that (gasp) were missing from my store cupboard – how did that happen? Now, come on confess, who ate them? I used a barrel aged feta cheese from Unearthed made with sheep and goat’s milk. And as we all know good things come from wooden barrels. The greatest of spirits, of wines, of vinegars, and more include barrel aging as a component of their taste. Wood is a wonderful flavouring agent. The Unearthed feta was glorious. Soft, salty and ever so creamy but retaining a lovely firmness. It was the best feta I have consumed outside of Greece. Great stuff guys, do keep it up! It is worth paying a little more for a good feta, the flavour is off the scale in comparison; and, please do not buy cows milk feta – it is nothing more than a glorified cottage cheese. Trust me you won’t regret it. Alternatively, you could always try making your own feta (style) cheese. A little oregano is essential here. I used a few leaves of fresh Greek oregano from my windowsill herb pots and a pinch of dried oregano rigani. The name “oregano” means “joy of the mountain” and has its origins in the ancient Greek “oros” (mountain) and “ganos” (joy). According to Greek mythology, the sweet, spicy scent of oregano was created by the goddess Aphrodite as a symbol of happiness. In ancient Greece, bridal couples were crowned with garlands of oregano. Oregano plants were placed on tombs to give peace to departed spirits. Vefa recommends an olive oil and vinegar dressing for the salad, but, I prefer to just drizzle with a little extra virgin Greek olive oil. The choice of course is yours.